Cripes, where did the time go? 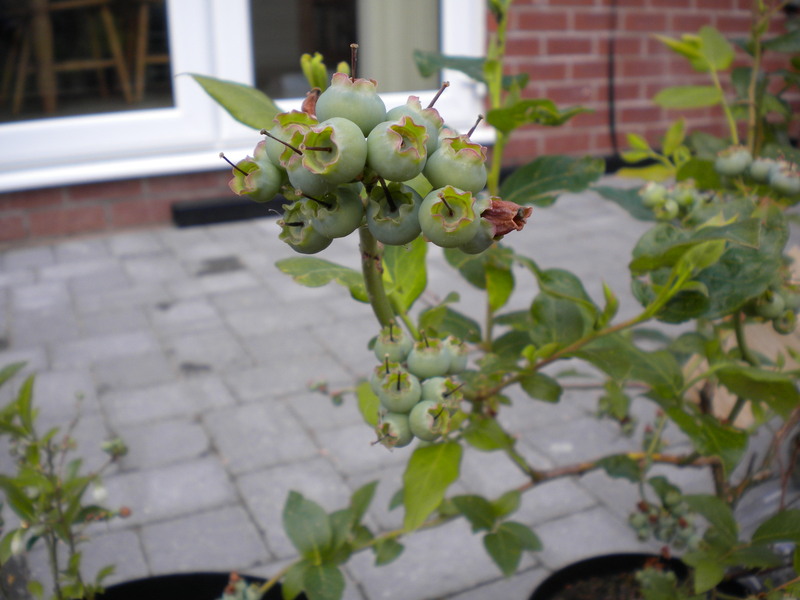 Over a month since my last garden update and everything has gone bananas! And these are almost the size of bananas………. …….and growing at a rate of knots!! 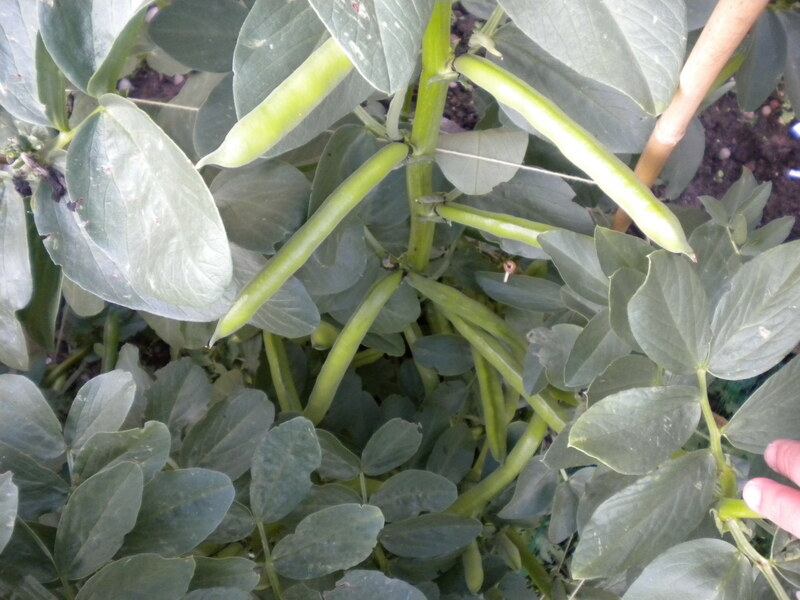 These are the broad beans that I direct sowed last October. They survived the winter and are about 4ft tall. The larger pods are almost ready to pick, I tried one a week ago but the beans inside were still quite small. 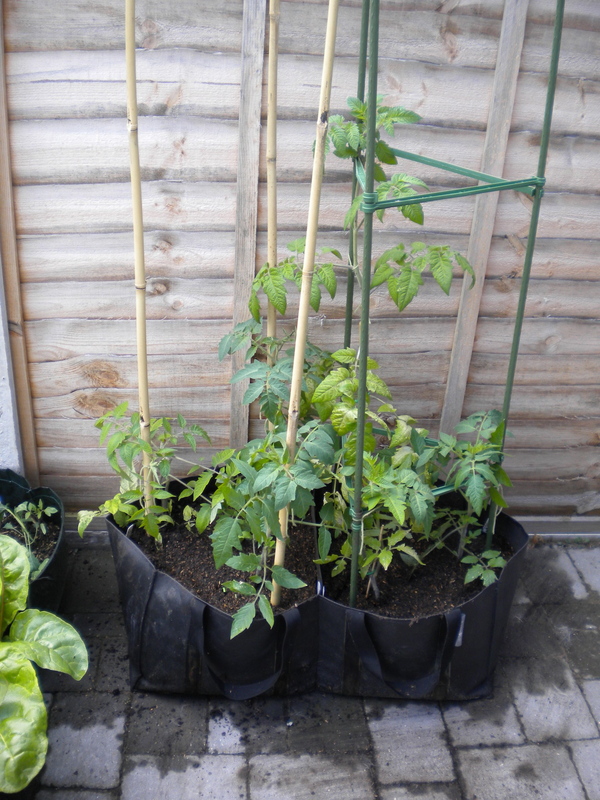 This morning I have finally got around to planting my tomatoes into their growing bag. 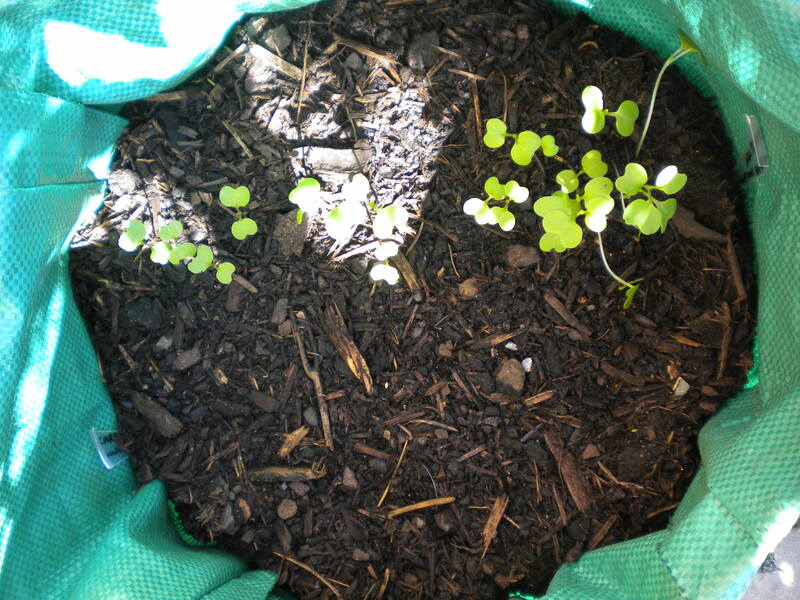 It is a two sided patio bag and I have filled it with part homemade compost and part New Horizon organic peat-free. A couple of weeks ago gave my step-dad one of each of the above 4 varieties and he is growing his in conventional grow bags so we shall see how his compare to mine as the weeks go by. 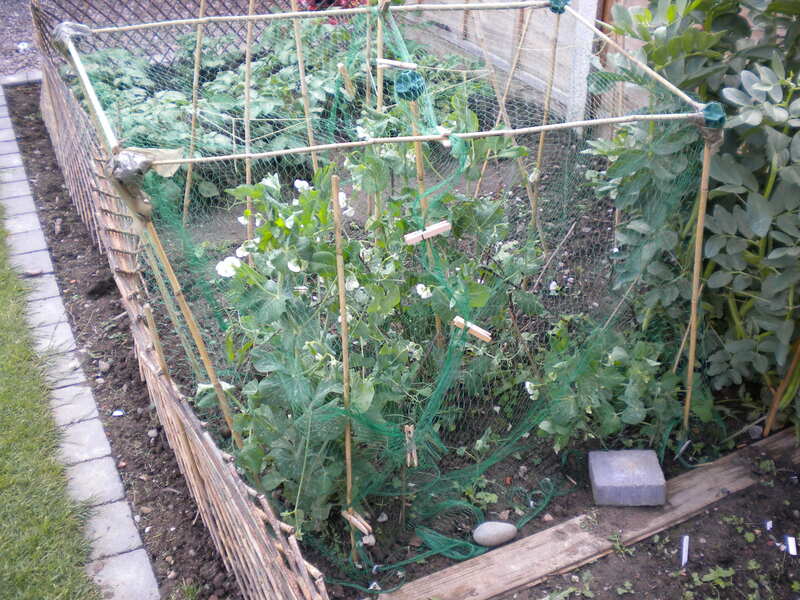 A few days ago i caught sparrows eating the leaves of my peas so we had to rig up a Heath Robinson style net using some canes, “BuildaBalls” and netting. There was much frustration from me as it kept falling over but in the end a bit of parcel tape and some clothes pegs were employed and at the moment it is still standing – just! 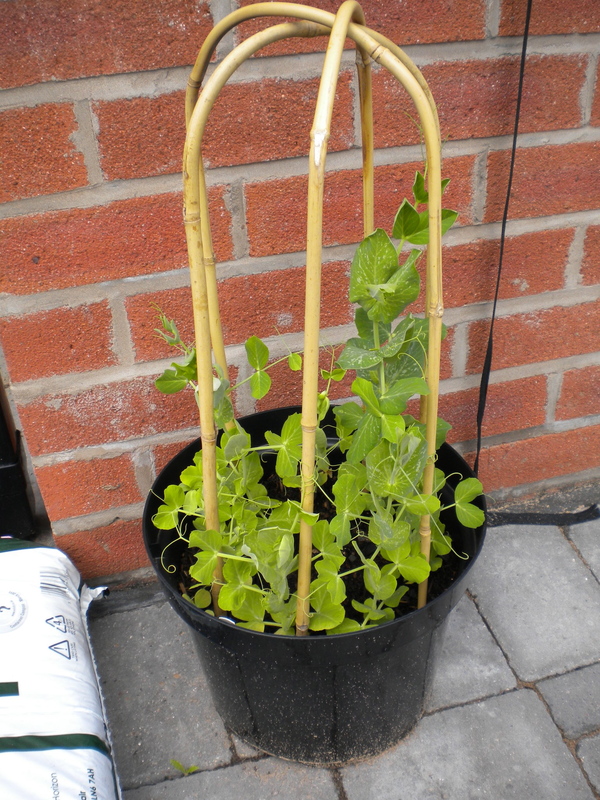 Thise are Meteor peas but I also sowed some Feltham First in a pot just outside the patio doors. They aren’t growing as fast but there is already a flower. I think there were some tomato seeds in the homemade compost I added as there are two rogue tomato plants coming up in the back right square amongst the kale! 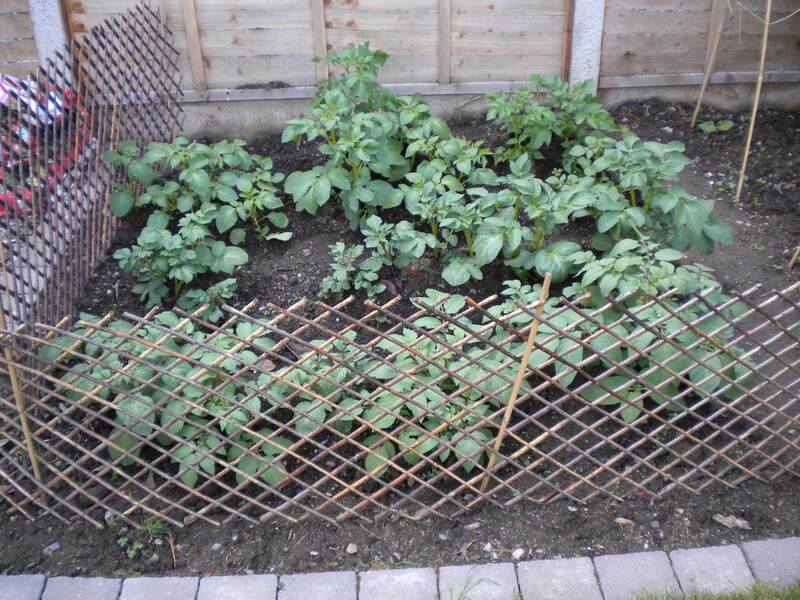 The potatoes are doing well and were earthed up on Saturday, and the onions and garlic are swelling nicely. 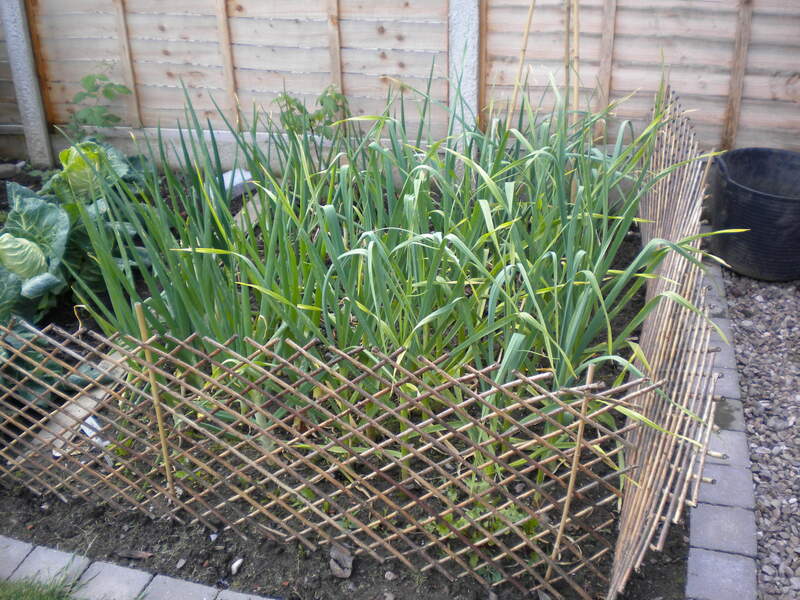 One of the onions produced a tall flower spike but on advice from UK Veg Gardeners I cut it off as apparently onions that flower don’t store as well. And finally the two non-veg beds. 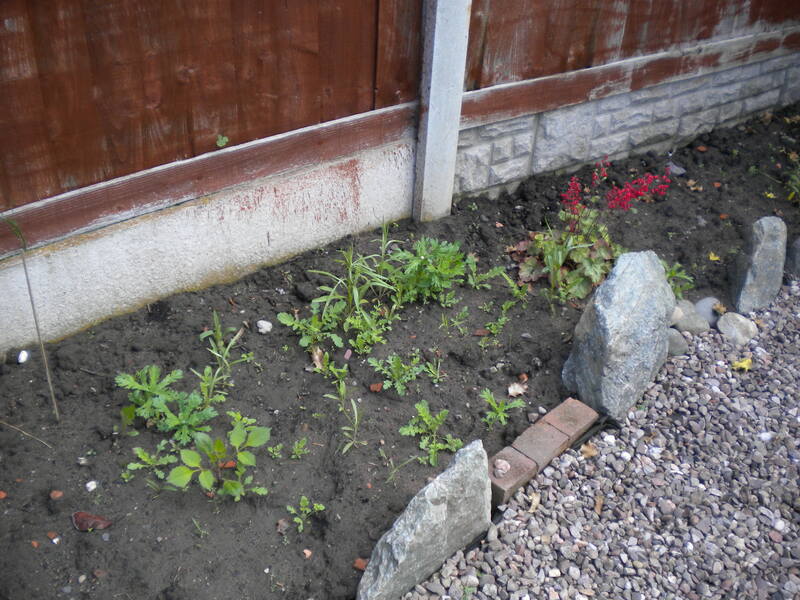 In this one I just scattered some wildflower, cosmos, echinacea, and poppy seeds back in March. I don’t know if anything is a flower or a weed at this point!! 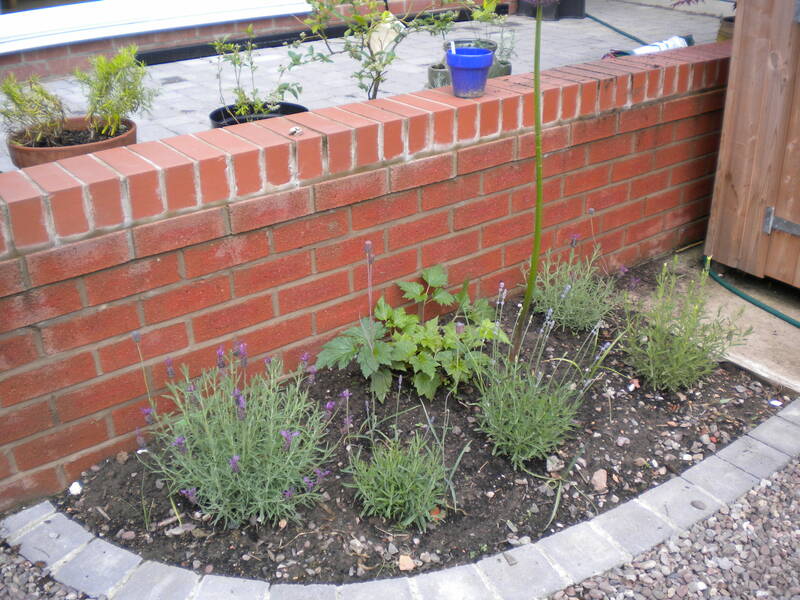 And this one I call the Purple Patch because by pure coincidence I realise I have planted (mostly apart from the snowdrops and a white-ish lavender) all purple flowering plants – lavender, allium (which I seem to have cut out of the photo!) and a Japanese anenome. 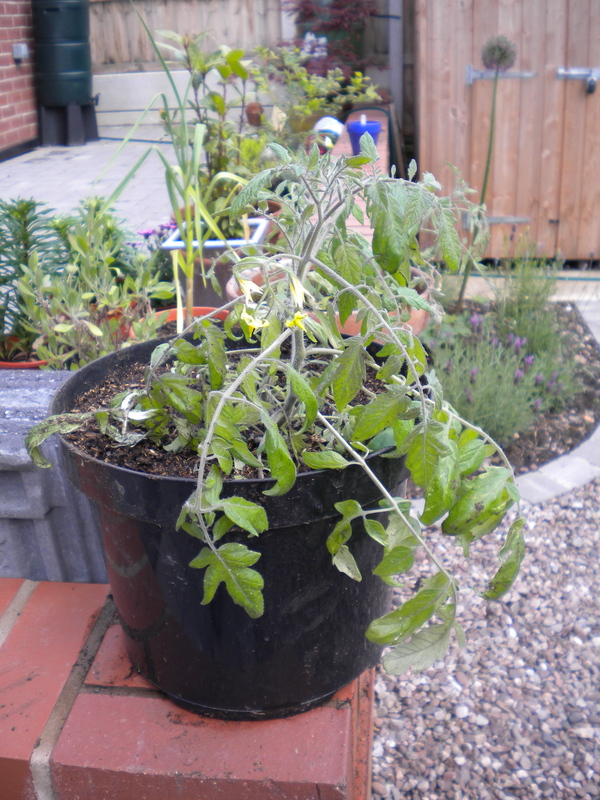 So that’s my garden round up for the beginning of June. 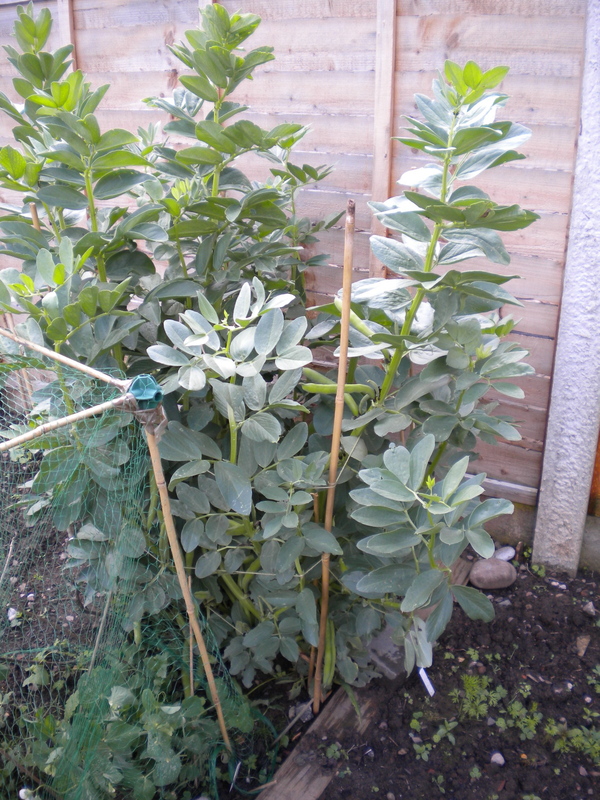 Hopefully the next post will be of my broad bean harvest!! 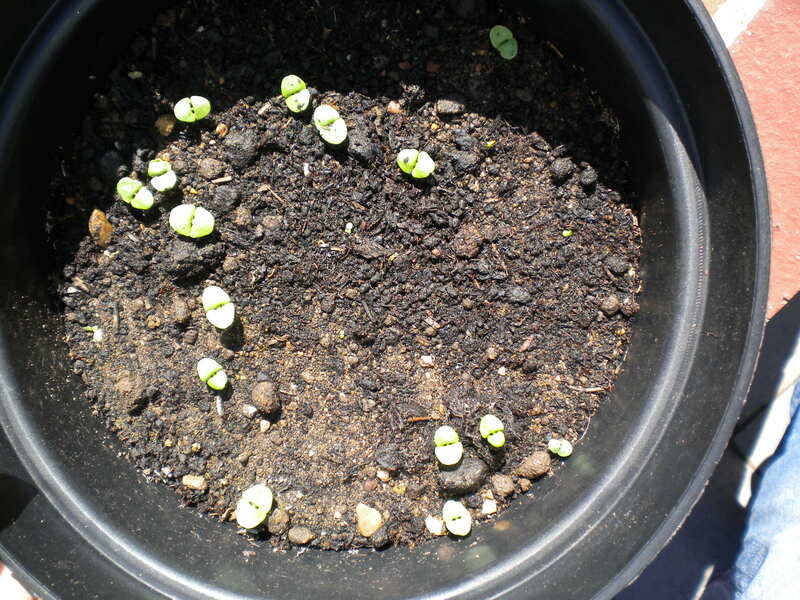 Apart from the bumper bean crop that developed while I was away – I was in Ireland by the way – some of the seeds I planted a couple of weeks ago have germinated. 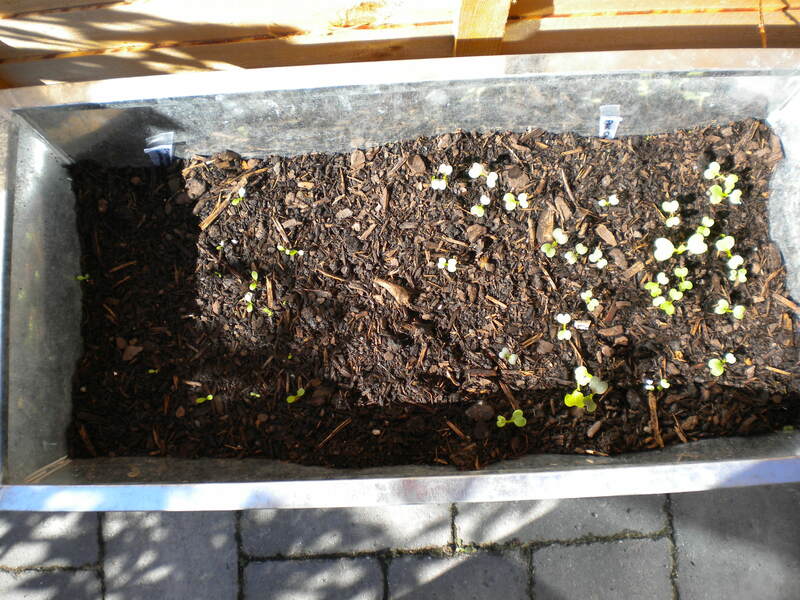 Chicory (left) & Pak Choi (right). There are a couple of carrots poking through as of today, honest! I’ll have to thin a few of them out though. These all came up really quick whereas my parsley is really struggling. 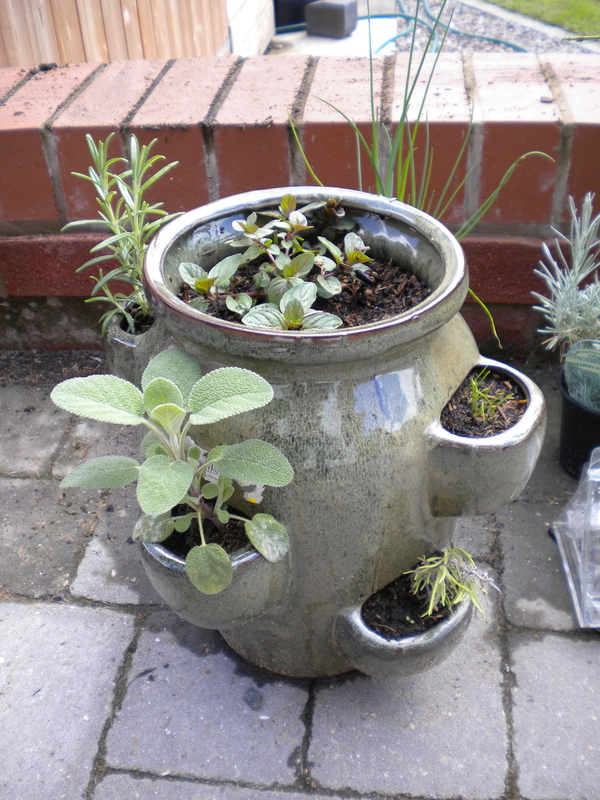 Also I think I may lose a couple of the lavenders but then again they were (technically) free so 4 out of 6 isn’t bad. Since I harvested the potatoes, the used compost has been sitting in a big bucket because I didn’t want to throw it away. But what to do with it? As a newbie veg gardener I am not sure what you can sow at which times of the year but some of the magazines seem to suggest that you can sow quite a few things this time of year. So this morning I got the potato grow bag back out of the shed, mixed half and half used compost and new peat free compost and filled it halfway up. I folded the top over and made two drills into which I put some carrot seed and some turnip seed. 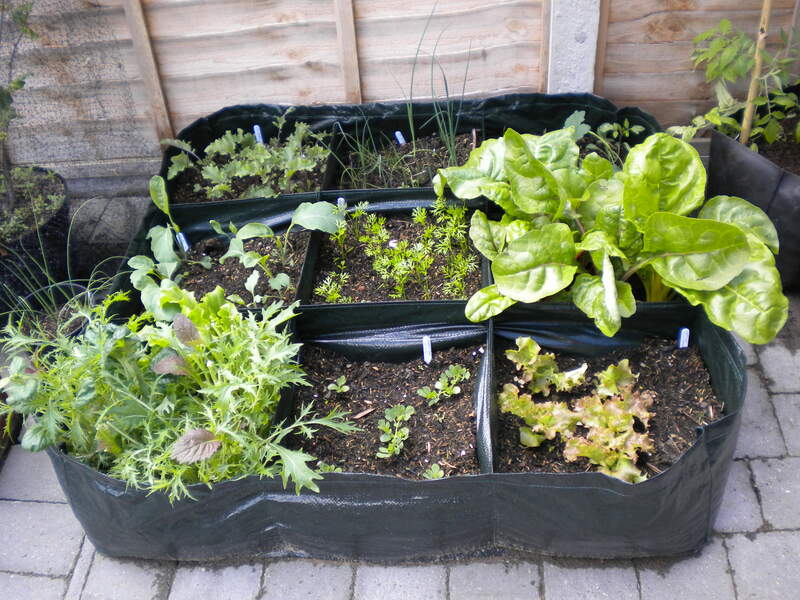 In my trough which had had mixed salad leaves and radishes, I again mixed in some new compost and sowed pak choi and chicory. All the seeds are freebies which I have collected from various magazines so if they don’t produce much it’s no biggie. Meanwhile I have the tiniest of shoots coming up in one of the pots I sowed with parsley about 10 days ago. I was starting to think nothing was going to grow but looks like something is happening after all! And, we have decided to let the guys our builder recommended loose on the garden. They are going to come around the beginning of September to do all the manual work like ripping up and replacing the old weed membrane and gravel, taking out some shrubs and root stumps, digging me a veg patch and laying a new lawn. Then it is up to us!! Yikes. My knitting and book blog is at ..